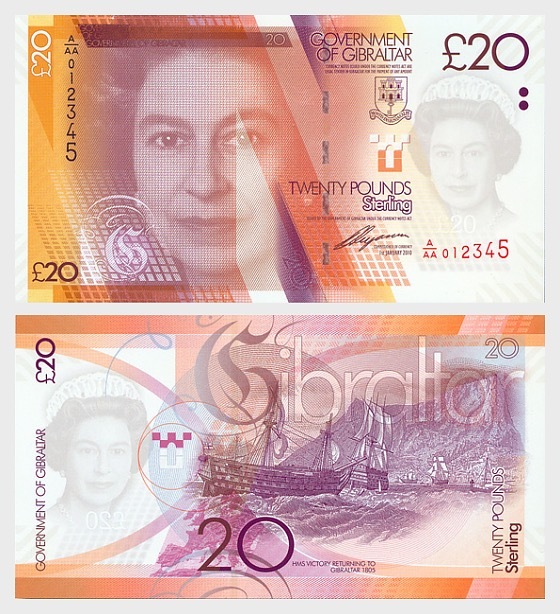 The £20 has an orange-yellow colour scheme, with the image of Her Majesty Queen Elizabeth II on the front, and HMS Victory arriving at Gibraltar on the reverse. Admiral Lord Nelson called at the port of Gibraltar on a number of occasions prior to the famous Battle of Trafalgar of 1805, fought close to Gibraltar, where he won a great victory but lost his life. The back of the £20 banknote shows the dismasted HMS Victory, the Admiral's flagship, being towed to Gibraltar after the battle, bearing the body of the dead Admiral.